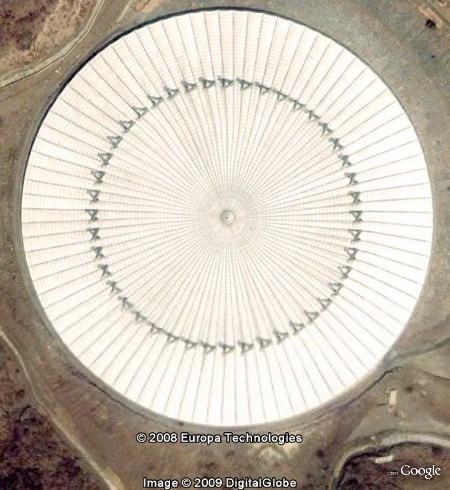 One of the earliest strange but beautiful object which I saw in Google Earth was the roof of Water Reservoir at Mina near holy city of Makkah, Saudi Arabia. The water reservoir caters to about 2 millions pilgrims who gather every year at Mina, during Hajj and it is covered by this huge cable-stayed reinforced concrete shell roof which has a diameter of 365 metres. The cover is supported by 88 concrete towers, each 60 metres in height. A network of thick pre stressed cables holds the concrete beams over which the roof is laid out. It is one the largest cable-stayed concrete shell roofs in the world. "The concept is based on the inherent stiffness of a ring of 'A' frames from which radial in-situ beams, cast using rotating formwork, are stayed with over 214m clear span. The roof is composed of precast concrete barrel vault shells, acting integrally with the beams to form a strong and efficient structure. The enclosed volume beneath the roof is 1.7 million cubic meter with a surface area almost 90,000 sqm and a perimeter of over a kilometer is greater than the London Millennium Dome."